Generally, Ollie gets on well with cats. Though in some cases, he is quite scared of them, especially when they spit and growl as he approaches them. A few doors down on the same side, a fluffy black and white cat has taken great objection to him, and will go so far as to advance out of the safety of its driveway, attempting to attack poor Ollie with claws at the ready. Ollie will back away rapidly when faced with this courageous feline, and it has earned itself the name ‘Brave Cat’, a name which Ollie now recognises. The bulky tortoiseshell cat from the house behind is not so bold. It will lurk under our bushes, hoping to be able to kill any bird that arrives to eat the food we put out. If Ollie spots that one, he goes after it like a rocket, and it scrambles back over the fence, to the safety of its home turf. In a nearby street called River View, lives a dark brown cat that waits in the bushes in his front garden. If Ollie comes close, it squeezes back into those shrubs, until it is impossible for the curious dog to get close enough to even have a tentative sniff. This cat has been christened ‘Hiding Cat’, and even when it is absent from its spot, Ollie will still carefully check, to see if it is in fact ‘hiding’. The most frequently encountered cat is the one next door, Alfie. He is normally called ‘Alfredo’ by me, and is very friendly. He also loves Ollie, and will rub his face around my dog’s saggy jowls. Ollie returns the affection by never chasing him, and allowing Alfie to roll about underneath him. But one local cat brings out the tradition in Ollie. The tradition that states that dogs will chase cats, at every opportunity. A ginger cat that lives close to Beetley Meadows, though I am not sure of his actual address. He likes to spend his days in the scrub grass, close to the River View entrance. 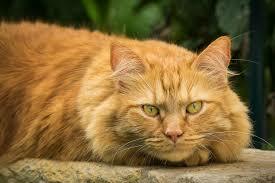 From there, the cat will pounce on small birds that fail to spot him, or even rodents that come across his path. The first time we spotted that cat, well over five years ago, Ollie took an instant dislike to it, and rushed into the scrub to chase it. The cat does one of two things, every time. If it sees Ollie coming, it makes a dash for the fence of the closest house on the corner, scrabbling up the wooden panels and dropping down the other side with a crashing sound. Because it is very pale in colour, it has been named Yellow Cat. But if Ollie gets close enough without being detected by the cat until it is almost too late, it climbs the small tree close to its favoured spot, resting between branches just out of reach of Ollie, who will be standing on two legs, trying to get to it. This happened on our walk yesterday afternoon. I had hardly slipped off Ollie’s lead, when he took off as if fired from a cannon. I spotted his target, Yellow Cat, lurking flat beneath that tree. Ollie covered the gap in record time, and was almost on top of the cat before it realised what was happening. It scampered up the tree, with just a second to spare, then casually draped itself across the branch, leaving Ollie yelping and whimpering with frustration inches below. After a few minutes of circling the tree, he walked back to me with a grumpy look on his face. I am sure if he could talk, he would have had something to say to that cat. My cat used to torment all the local dogs. He was definitely a brave cat type! A very familiar story 🙂 Dogs love the chase, but are never sure what to do when they catch them, but then cats are very rarely caught. Our Dennis will happily chase our two cats, but she is equally as happy grooming them, with Sylvester happy to roll over to get his belly done. They do seem to pick and choose which cats they like. And vice-versa. I so love your writing, Pete! Excellent story and my significant other, Richard and I are animal lovers big-time, so it was especially meaningful. It is interesting to see the animals with their own little personalities (sometimes huge ones), and wonder if they see us the same ways. We have some six smallish dogs, all but two pure chihuahuas (not purebred, but genuine), and two of unknown mix, but we think a lot of chihuahua. One Richard believes is at least part Rat Terrier because of his tiny self and thin little tail, but we don’t know for certain. He is deaf, about 10 years+ and has a collapsing trachea, and we rescued him from being a dumpee into our senior mobile home park during a horrible rain. He was very ill and we personally nursed him back to health. And there is Brownie, with her sister, Dolly, and they are from mama, our tiniest chi. They are deer heads and mama (who is also Tippy), is an applehead. Brownie is a special needs dog, for we believe she was the last born of three and the first one was stillborn, so by the time she came out, she didn’t get enough oxygen and so is like a special needs autistic child sort of, but a gentle and loving soul. Oh, and Charlie, a tan chi came to me one Christmas eve many years ago when I took some towels and newspapers to the local pound. Apparently the people were in the back celebrating the holiday and so I left my things and was headed out when a lady came to the door and asked me if I would hold him so of course I did as he was a pup then and it was cold. I waited and waited, and then looked out after awhile and my car and the pound vehicles were the only ones there, so I looked at the poor shaking little guy and told him, “That’s it, you are not staying here on Christmas eve.” I still have him after I think about 10 years. I lose track of when they all came. One of the others we named Yukon Jack, we always joke is part husky with chihuahua. He is the largest in overall chunky body and height, though not much larger than the others. He talks to me constantly in this funny voice like a husky, and gets on my lap and puts his head under my arm as if he were a sad baby, so I also call him Baby Jack. His owner, who had tried to commit suicide, left him with us because he had to go live somewhere else where he would be safe. Every now and then he comes back to visit his old dog, but Baby Jack thinks he is our dog now and I could not let him go back again ever. All the dogs sleep with us and now too our one cat that is another rescue, Yao Yao, who sleeps above Richard’s head at night. Best wishes to you, Pete. That was a really neat post. It kind of brightened up what was a sad day yesterday. I really enjoyed it. If I could pick a favorite for the whole day that would have been it. Haha… loved this one Pete. I once had a Doberman x Weimaraner and we also had a couple of cats. One fostered cat called Bert was quite elderly. The puppy tried chasing him and he turned round, sat up on his hind legs and whacked the pup across the face with both front paws one side after the other. The pup never bothered him again. It was so funny to see the pup’s expression. The Brave Cat ‘boxes’ Ollie’s face like that, if it gets the chance! 🙂 I imagine that its sharp claws don’t feel too good on Ollie’s velvet-soft jowls. Often they don’t bare their claws, just the slap works! The different reactions Ollie has to the various cats is really interesting, Pete. One evening in the summer ( remember when we had to water the garden every evening? ) an elderly neighbour dressed up to the nines in high heels and glitter appeared at the front gate. She was waiting for her ‘boyfriend’ to pick her up to go dancing, but she couldn’t go out until she had shut her young expensive half persian cat in the house. The cat she described sounded like the large new villain who had been chasing our birds. I helped her look round my back garden, to no avail. That’s very kind of you, TS. I don’t pass-on blog awards, but I will happily answer any questions in the link. Sounds like Ollie has a large group of “friends” to play with on a regular basis! I swear that in Yellow Cat’s off hours she lives next door to us. Drives our dog nuts. By golly, Ollie, that yellow-bellied scaredy-cat knows he’s not a catamount. In fact, that cat don’t amount to much of anything! Have you ever been attacked on a walk? One day Bear and I were walking and a lady had two loud dogs off a leash and they bolted right to bear and attacked. I’m a’ kicking and yelling and the lady bounces up and can’t understand it. “They’re usually so friendly!” It took all my nerve not to kick her. Hahaha. I need to step softlyly and carry a big stick. One of my dad’s whippets was terrified of cats after one jumped from a wall onto his back, digging all its claws in. He’d cross the road rather than walk past that wall again and never chased any cat. Alfredo sounds like a lovely cat. Animals have different personalities just like humans – some we like and some we don’t. Alfredo sounds like a cool cat. What will Ollie do if he ever catches Yellow? Alfredo Cat is very laid back. He’s black and white, and loves to have his belly rubbed.